Claim rejections and claim denials create considerable financial burden for US hospitals and health systems. Despite new revenue cycle technology, managing these denials remains a costly and time-consuming endeavor. Many organizations simply walk away, choosing not to correct, resubmit, or appeal. The result? Millions of rightfully earned provider dollars are left in the pockets of Medicare and third-party payers. Certainly, a smarter strategy is to avoid losses associated with denied inpatient claims by increasing the percentage of claims approved in the first place. Investments in people, processes, and technology to prevent denials are far more effective than dollars spent on managing them. As hospitals and health systems pivot from denial management to denial prevention, inpatient prebill audits have reemerged as an effective reimbursement retention strategy. 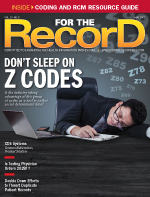 But in the ICD-10 era, how effective are prebill audits? Formerly considered too significant a delay on discharged not final billed (DNFB), today's prebill audits are making new inroads into HIM and revenue cycle workflows. In fact, proactive audits have become an important practice for ensuring accurate and timely reimbursement. One of the traditional hurdles with implementing prebill audits is extended DNFB, which may negatively affect cash flow. Although prebill audits may delay claim submissions, the identification of one accidentally omitted complication or comorbidity (CC) or major CC (MCC) can usually justify the addition of a few hours to the organization's DNFB. Another common objection to prebill audits is increased staffing. However, even when hiring one or two additional full-time staff members or enlisting consultant resources, the savings in terms of compliance and revenue opportunities typically outweigh the cost of these individuals or services. In today's environment of dwindling reimbursements and rising costs, the benefits of prebill audits are often worth the potential risks—even more so when HIM and revenue cycle professionals take proactive measures to ensure a positive return on investment. When performed correctly, prebill audits do not delay DNFB and can be expanded to include diagnosis-related group (DRG) and clinical validation. The following three steps are vital to establishing a successful prebill audit program. The primary question is how to identify high-risk MS-DRGs, which typically fall into one or more of the following categories: high-dollar MS-DRGs, MS-DRGs with only one CC/MCC or no CC/MCC, long stays with low-weighted MS-DRGs, short stays with high-weighted MS-DRGs, coding/clinical documentation mismatches, mortality cases, and diagnoses or procedures on the Office of Inspector General's recovery audit contractor (RAC) hit list. Once target accounts are identified, ensuring an efficient workflow is critical. Identified cases should be moved to an audit queue to facilitate the review process. Both internal and external prebill auditors confirm the presence of appropriate clinical documentation, assess the quality and content of the clinical documentation to support the assigned codes, and compare the assigned codes with the application of final codes. It is important that all prebill reviews incorporate updated coding books, coding guidelines, Coding Clinic references, and clinical indicators. This assumes ongoing review and training on new guidelines are already part of the organization's denial prevention best practices. If the prebill audit reveals no findings, the claim should be sent to billing for submission according to system workflows and automation. However, if the auditor disagrees with the original code assignment, an immediate dialogue between coding, clinical documentation staff, and/or the physician liaison must be established to consider the recommended revisions. The team will need to determine whether physician queries are necessary. Once any additional documentation is obtained, the final steps are to submit the case for billing and conduct education as needed. Prebill audits are an organization's best defense against claim denials and RAC audits. A proactive approach that ensures clean claims up front not only mitigates risk but also promotes accurate reimbursement, reduced costs, and overall revenue integrity. However, for prebill audits to be initially approved and continually supported, a positive return on investment must be achieved. The first step is to quantify how much revenue is currently being lost due to rejected and denied claims. There are several industry protocols to determine and monitor this amount. Current trends in RAC and other audit reviews demonstrate a propensity to review cases with only one CC or MCC. Calculating the dollar value of these discharges is critical. A decrease in retrospective query rates is another time- and cost-saving outcome of prebill audits. Keep in mind that prebill audits extend beyond validating MS-DRGs. They also ensure clinical validation for each claim to reduce reimbursement take-back risk based on failed medical necessity. Once a chart undergoes prebill review, the organization significantly increases the certainty that the claim will be accepted and paid. That's an assurance hospitals and health system executives can certainly embrace. — Kimberly Carr, RHIT, CCS, CDIP, CCDS, is the director of clinical documentation at HRS, where she oversees the auditing consulting services and provides education and training to the remote coders and auditors. — Jonathan LaFleur, BSN, RN, CCS, is an auditor at HRS with more than 16 years of health care experience, both at the bedside and in HIM.